The acute risk of political instability has been growing steadily in Algeria since early 2019. The decision by President Abdelaziz Bouteflika to seek a fifth consecutive term in elections scheduled for April 2019, despite his poor health, sparked the largest political protests in Algeria in over two decades. Whether Bouteflika will remain a candidate and who Algeria’s next president will be are still unclear. Meanwhile, the Algerian National People’s Assembly has succumbed to a crippling leadership struggle and the military, historically Algeria’s bastion of stability, is in flux after almost all senior military leaders were replaced over the last six months. Algeria’s economy is also stagnating as a short-lived bounce from a 2018 expansionary fiscal policy dissipates, and analysts predict an increase in unemployment in 2019. Against this backdrop, a bungled leadership transition and continuing economic stagnation could lead to further instability in Algeria that would have significant ramifications for U.S. counterterrorism interests and regional stability. As violent extremist organizations intent on harming the United States and its allies have inundated North Africa and the Sahara in the last decade, Algeria has been a regional counterterrorism stronghold. However, civil strife in Algeria could distract from its counterterrorism efforts and open a broad geographic expanse to violent extremist organizations, allowing these groups to operate more freely and potentially travel unhindered to Europe. 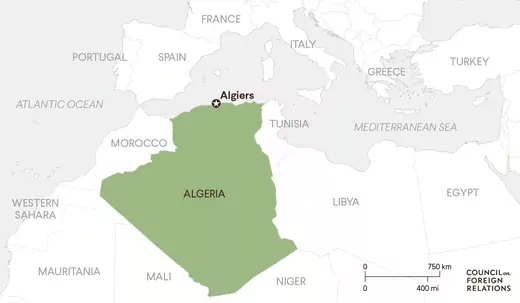 Instability in Algeria would affect the United States’ regional partners, including Nigeria and countries in southern Europe, which are concerned about spillover from potential terrorist activity in Algeria’s south and increased migration to Europe from its north. Although the United States has limited influence on events in Algeria, Washington can take worthwhile steps to manage the risk of growing political instability, including precautionary measures to safeguard its interests should the worst happen. Map of Algeria and surrounding countries. Analysts in the United States, Algeria, and Europe have argued that despite problems such as political dysfunction and an underperforming economy, the current Algerian leadership and wider population place such a premium on stability that the country will maintain its political status quo in the next ten to twelve months. However, the country is vulnerable to the same risk it faced in 1988, when it was rocked by unexpected (and still largely inexplicable) deadly and destabilizing riots. At that time, the economy was in a tailspin due to rock-bottom oil prices, and civil society was questioning the president’s legitimacy and the government’s stewardship of the republic. The October 1988 riots resulted in a political and economic opening that in turn resulted in the civil war of the 1990s—Algeria’s “dark decade.” Algeria faces a similar risk today, and one of the following situations—or a combination of those—could spark a crisis. President Bouteflika leaves office without a clear successor. Political uncertainty in Algeria is extremely high. President Abdelaziz Bouteflika’s health has seriously deteriorated, and he has no clear political successor. He has stated his intention to run for a fifth consecutive five-year term in April 2019, but popular protests have seemingly pressured his supporters to withdraw their approval of his candidacy. If he does run for office, he will almost certainly win reelection, but it is unlikely that he will be able to complete the full term (until 2024) given his physical condition. Bouteflika’s supporters argue that despite his physical incapacitation, he retains his full mental capacity and understands current affairs. His detractors insist that the president is both mentally and physically impaired and is unable to fulfill the duties of his office. Bouteflika’s health and the potential withdrawal of his candidacy or the shortening of his presidency should he be reelected increase the likelihood that Algeria will undergo an irregular presidential succession in the near future. Regardless of whether elites name a successor, the first post-Bouteflika president will face a crisis of legitimacy. If an off-term election does occur, Algeria’s disparate political elite, including members of the military, might not reach a consensus on Bouteflika’s successor. There is a constitutional process for off-term elections, so the election process would not itself be destabilizing, but an inability to identify a consensus candidate to succeed Bouteflika could result in postponed elections and would leave the country without clear leadership. Disagreements occur in the Algerian media about the country’s trajectory and its current leadership, but Algerian elites are discreet and rarely question Algeria’s political circumstances publicly. If the behind-the-scenes disagreement among Algeria’s commercial, military, political, and public-sector elite (elite fracture) unfolds in public, policymaking could also freeze or become incoherent, exacerbating the leadership crisis. Regardless of whether elites name a successor, the first post-Bouteflika president will face a crisis of legitimacy. For the last fifty years, Algerian leaders have used participation in Algeria’s war against the French as a legitimizing narrative, and no alternative has been crafted to replace it. Bouteflika is the last leader from the moudjahideen, the veterans of the Algerian War of Independence. Proponents of his government are trying to craft a new narrative around Bouteflika’s legacy to circumvent the problem posed by the passing of the moudjahid generation. However, “Bouteflikism” is an indistinct mixture of nationalism, protectionism, socialism, and statism, and is not as compelling as the moudjahid story. Meanwhile, opposition parties have embraced disparate narratives—Berberist, Islamist, Trotskyite—but have not gained many voters. To wit, protestors in Algeria rallied in opposition to a fifth mandate for Bouteflika on March 1 but did not articulate an alternative narrative or candidate. In fact, a turning point in the protests was when they were joined by Djamila Bouhired, herself a celebrated moudjahida. Absent a legitimizing narrative, Algeria’s next president is unlikely to enjoy widespread support. Rather, elite factions will challenge his leadership and popular movements will question his legitimacy. Algeria’s tighter economic circumstances have hindered the state’s ability to provide services as well or as regularly as it did in the past. An economic crisis limits or eliminates government services, sparking national protests. Algeria’s economy is in trouble. Its oil and gas sector—which accounts for approximately 30 percent of gross domestic product (GDP), 60 percent of budget revenues, and 95 percent of export earnings—is facing the effects of nearly a decade of energy-sector mismanagement. Frequent leadership turnover has discouraged foreign investment and inhibited the development of new oil and gas assets. Revenue at the state-owned energy company Sonatrach decreased from $76 billion in 2008 to $33.2 billion in 2017 due to decreased energy prices following a price crash in 2014 and increased domestic energy consumption, which also led to lower volumes available for export. To offset declining oil and gas revenues, the government tapped into the country’s abundant foreign exchange reserves. However, those have declined by more than 50 percent since 2014, and the government has since resorted to printing money. Algeria’s tighter economic circumstances have hindered the state’s ability to provide services as well or as regularly as it did in the past. Inflation and a concomitant increase in the cost of living has made it more difficult for many to secure daily needs. Protests throughout the country over basic services like education, electricity, health care, housing, pensions, and the water supply are more frequent; and because the state does not have the funds to respond to every grievance, protests last longer and are more intense. Protest movements in Algeria have historically targeted discrete goals, like providing social services, promoting human rights, or fighting corruption—or they have been limited to cities such as Ghardaia or Kabylia and did not spread across the country. Some attempts have been made to form nationwide protest movements, including the 2014 Barakat movement (“enough” in North African Arabic), which tried to prevent Bouteflika from running for a fourth term, and the 2018 Mouwatana movement (“citizenship” in Modern Standard Arabic), which opposes Bouteflika’s fifth term. The Barakat movement dissolved after Bouteflika won reelection in 2014, and thus far the Mouwatana movement had limited its activities to eastern Algeria. The challenge posed by the March 1, 2019, protests is twofold: because they were about Algeria’s political system and not about tangible grievances, the government could be at pains to respond to them in a way that will mollify the protestors’ complaints; additionally, the protests are likely to result in the government entrenching itself and effectively shutting down until the country’s leadership trajectory becomes clearer, which could weaken the government’s ability to provide important social services. Military or law enforcement use violence against Algerian citizens. Algerians widely accept that the military and, to a lesser extent, law enforcement forces represent and support the population. However, the military, which is responsible for quashing internal threats and repelling external ones, and law enforcement, which is responsible for managing protests, are under-resourced and overextended. If overworked law enforcement or military officers killed one or more protestors against the backdrop of a succession crisis and ongoing economic challenges, Algerians would perceive the incident as a betrayal of the state’s obligations to its citizens. State violence against protestors could unite Algerians against the government, inaugurating a new era of instability. In short, a succession crisis could soon accompany Algeria’s current economic crisis. 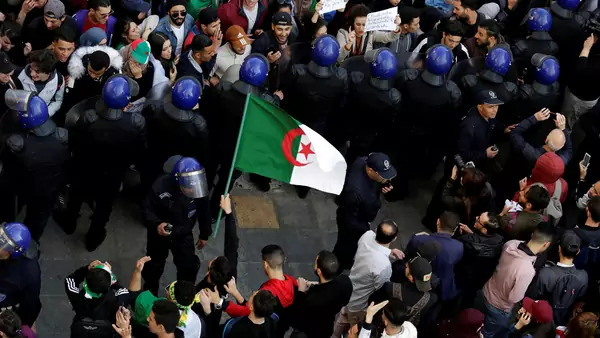 If conspicuous elite fracture, disagreements within the military, and economic decline continue, Algeria could face widespread protests beyond just the March 1 protests and corresponding state violence against the population. Ultimately, Algeria could undergo a period of significant instability, with wide-ranging implications for regional stability. The government’s response and that of regional partners will determine whether Algeria can manage a growing crisis. Several warning indicators would signal Algeria is becoming more at risk. Elite fracture. Public disagreement among the high-ranking military officers, oligarchs, or upper echelons of political leadership, including cabinet members, leaders of political parties’ ruling coalitions, and members of parliament—the elites—over Bouteflika’s ongoing presidency or about his potential successor could indicate the beginning of widespread instability. Politicization of the military. Public disagreement among security chiefs or the withdrawal of overt military support for political leadership could call into question military support for political leaders. Different blocs within the military or security services could recommend opposing courses of action, thereby limiting the effectiveness of the security services. Another related warning indicator would be if recently retired military officers, including retired members of the once-omnipotent intelligence services, start to agitate publicly against political leadership. Grassroots popular protests. The March 1 protests are unlikely to be an isolated event and there is now a fertile environment for more civil unrest. The government, used to handling conventional protests that call for tangible concessions from the state, could make a misstep in handling these larger protest movements, further undermining public trust. Sustained low energy prices. Algeria is a socialist state, with its social contract predicated on the state’s provision of services. Algeria is also a rentier state, and its budget depends heavily on oil and gas exports. A reduction of revenue from oil and gas and a further depletion of foreign exchange reserves would threaten the state’s ability to provide social services and thus fulfill its social contract. Energy price volatility will likely continue, but Algeria will face a higher likelihood of political instability if crude prices remain depressed for more than two years. Although the United States has minimal direct diplomatic, economic, and military exposure to Algeria, it does have security and investment partnerships there. The United States recognizes the importance of Algeria for its influence on counterterrorism efforts, migration flows, energy disruption, and instability contagion across North Africa, the Sahel and Sahara, sub-Saharan Africa, and Europe. Through a mutual legal assistance treaty with Algeria, the FBI provides training for Algerian law enforcement, and the U.S. Department of State’s Bureau of Counterterrorism and Countering Violent Extremism provides assistance with counterterrorism activities along Algeria’s border. However, the U.S. military does not conduct partner capacity–building programs, nor does it have a status of forces agreement with the Algerian military. U.S. investment is also limited to the oil and gas sector, as well as some activity in the pharmaceutical sector. Total U.S. foreign direct investment (FDI) in Algeria amounts to less than $5 billion. Increased European dependence on Russian gas supplies, owing to disruptions to Algerian oil and gas sector, would give Moscow more leverage over the United States’ European allies. Governments in southern Europe—in particular France and Italy—are also anxious about the prospect of instability in Algeria. Paris and Rome are concerned that instability could lead to an increase in cross-Mediterranean migration to Europe. An influx of migrants could inflame European political discourse, including the immigration debate, and fuel the rise of far-right political parties, which would further erode EU solidarity and complicate the United States’ alliances throughout Europe. Civil strife in Algeria could also result in episodic disruptions to its oil and gas sector, from either mismanagement or terrorist attacks, with serious implications for European energy security. In the first half of 2018, 10.7 percent of the EU’s total non-EU natural gas imports came from Algeria. Disruption of this supply could lead EU countries to depend more on Russian gas supplies—and, as it did in 2014, Moscow would not hesitate to politicize its European exports. Increased European dependence on Russian gas supplies would give Moscow more leverage over the United States’ European allies. A leadership crisis in Algeria could also draw in Persian Gulf countries. Gulf state competition for influence in Algeria would further complicate U.S. policy approaches to the dispute between the “Quartet” (Bahrain, Egypt, Saudi Arabia, and the United Arab Emirates) and Qatar, as well as to Algeria itself. Saudi Arabia and the United Arab Emirates may attempt to fund Madkhali Salafi groups (status quo political actors) in Algeria, as they are currently doing in Libya; and Qatar might channel support to Ikhwani groups (political and social activist Islamists). The involvement of Gulf benefactors would exacerbate tensions between Madkhalis and Ikhwanis in Algeria, who have thus far been dormant political actors. As they did in Libya, revived tensions between Madkhalis and Ikhwanis would prolong a leadership crisis. Preventing political instability in Algeria presents a policy challenge for the United States because the options to doing so are extremely limited. In addition to the opacity of the decision-making process in Algeria and the relatively low level of interactions between U.S. officials and their Algerian counterparts, Algeria resists any infringement on its sovereignty. As a result, U.S. proposals intended to steer Algeria toward a more certain political trajectory and away from potential instability should be restricted to indirect initiatives and will mostly involve working through other interested parties, such as France and Italy. Preventive measures should be designed for the long term, beyond the immediate contingency. They should aim to help alleviate social pressures by contributing to Algeria’s economic growth and forging stronger ties in Algeria to better anticipate the country’s political trajectory. These measures should include supporting the Algerian electoral process, encouraging economic reform through diplomacy and communication, working more closely with Algeria’s neighbors in North Africa and with European allies, and improving the United States’ understanding of the inner workings of the Algerian political system. The State Department should lead democracy promotion and leverage diplomatic relationships with Algerian counterparts. First, to promote stability, the United States could communicate to Algerian political elites the importance of following constitutionally mandated processes for presidential succession. The Algerian constitution delineates how irregular presidential successions should proceed, and the United States could emphasize that adhering to these processes—regardless of who ultimately becomes president—helps ensure stability. Given the State Department’s role in democracy promotion around the world, the department should lead this undertaking and leverage diplomatic relationships with Algerian counterparts, including through the U.S.-Algeria strategic dialogue and the efforts of the U.S. ambassador to Algeria. U.S. nongovernmental organizations have historically had a minimal presence in Algeria, and their efforts at messaging and outreach would likely have little effect. The United States could coordinate its emphasis on adhering to constitutionally delineated succession processes with France and Italy to ensure that Algeria’s allies and partners are speaking with one voice. Because of the painful legacy of France’s colonial presence in Algeria, Paris can only address Algerian issues in a limited manner. Rome, however, is not bound by the same historical constraints. Second, the United States could foster Algerian economic development and diversification by encouraging Algeria to fortify its economy through FDI. Algeria is already taking some steps to encourage FDI in the automotive assembly sector and in the oil and gas sector, attracting investments from France and Italy, but a host of other economic sectors could benefit from U.S. guidance. Algeria’s agriculture, health care and pharmaceuticals, information technology, and renewable energy sectors are ripe for investment. U.S. government outreach to organizations like the American Chamber of Commerce in Algeria, the U.S.-Algeria Business Council, and the Business Leaders’ Forum (FCE) could help these groups advocate for economic reforms to facilitate FDI. Furthermore, the United States could expedite the bilateral U.S.-Algeria Trade and Investment Framework to provide U.S. firms with more governmental support and guidance as they pursue investment opportunities. Again, the United States could align its efforts to foster FDI in Algeria with its European allies, including France and Italy, as well as the broader European Union. The United States should be prepared to offer emergency funds or services to mitigate the harms from a lapse in Algerian services. In addition to supporting increased FDI, the United States could promote bilateral technical aid to Algeria, particularly in major sectors like agriculture and renewable energy. Algeria’s population is slightly more than forty million, but it is among the world’s top ten importers of grain, wheat, and maize or corn. It is therefore keenly interested in expanding its domestic agricultural activity. To make more energy available for export (and thus generate more revenue), Algeria is also targeting its renewable energy sector as a source of domestic electricity, with the aim of using renewables for roughly 40 percent of domestic electricity consumption. The United States could work with the European Union to speed Algeria-EU trade agreements, particularly in the agriculture and energy sectors, and provide bilateral aid to help Algeria realize these strategic priorities. Despite concerns over foreign interference, Algeria does recognize when it needs assistance. If sustained low energy prices mean that Algeria is unable to provide social services, the United States should be prepared to offer emergency funds or services to mitigate the harms from a lapse in Algerian services. Algeria would be more inclined to accept external support for the health-care sector, which is less controversial than others. Third, the United States could leverage its relationships with Algeria’s neighbors and European allies to prevent instability and encourage economic diversity in Algeria. By creating a broader strategy for the region—including Morocco, Tunisia, and the African Union (AU)—the United States could stymie unrest and lessen the risk of instability contagion from neighboring countries. In Tunisia, economic reforms would reduce social tensions that fuel instability and extremism along its borders. In Morocco, support for economic decentralization programs would decrease eastern Morocco’s economic reliance on informal cross-border economic activities with Algeria. Washington has already provided such support through the U.S. Agency for International Development’s Fiscal Reform for a Strong Tunisia program and the agency’s Country Development Cooperation Strategy in Morocco, and it should continue to do so. Strengthened economies in Morocco and Tunisia would also create additional markets for Algerian exports. The United States could increase intelligence sharing with Morocco and Tunisia and reinforce partner capacity–building programs with their militaries. The European Union may have more influence in Algeria than the United States. Italy, Spain, and France are Algeria’s largest export destinations and France, Italy, Spain, and Germany are its largest import origins. The European Union has frequent and varied contact with Algeria, including in the context of the EU-Algeria high-level dialogue on regional security and counterterrorism, the EU-Algeria energy dialogue, and the “five-plus-five” dialogue, which considers migration, among other topics. Because of the importance of the EU-Algeria relationship, the United States could work with the European Union to indirectly bolster economic diversification and regional stability while respecting Algeria’s sovereignty. By using relationships with multilateral organizations and regional allies and partners, the United States could gain a better understanding of events in Algeria. To provide early warning of instability in Algeria, the United States could increase intelligence sharing with Morocco and Tunisia and reinforce partner capacity–building programs with Moroccan and Tunisian militaries. The United States could also send officials to work more often with the African Union. Algeria plays a significant role in security and counterterrorism issues there, through the efforts of Smail Chergui, the AU commissioner for peace and security, and Ramtane Lamamra, the AU high representative for Silencing the Guns in Africa and special diplomatic advisor to Bouteflika. Last, the United States could gain additional insights into Algerian politics, which are opaque and poorly understood in Washington, by working more closely on issues where Algeria demonstrates expertise and interest. For example, Algeria has been deeply involved in creating durable solutions to the political and security crisis in neighboring Libya by facilitating dialogue between different Libyan parties to the conflict. Washington could win support from elites in Algiers by acknowledging and supporting these efforts at peace brokering. Algeria also has vast experience with Saharan and Sahelian security issues, though its experience with sub-Saharan Africa is typically overlooked by Nigeria, South Africa, and Gulf of Guinea countries—and by the State Department. If the United States works with Algeria on sub-Saharan Africa issues, it could also marshal sub-Saharan African states’ concern for and relations with Algeria, creating stronger cross-regional ties. In this vein, the United States could encourage Algeria to participate in the Consultative Group on Prevention and Stabilization in the Lake Chad Region in an observer capacity and facilitate Algerian participation in an advisory capacity with the Group of Five for the Sahel (G5 Sahel). As a result of the Arab Spring uprisings, the United States has significant experience in reacting to unstable situations in the Middle East and North Africa. Unfortunately, not a single outcome from the Arab Spring has helped U.S. regional interests, and few lessons were learned from the instability in Egypt, Libya, Syria, Tunisia, and Yemen that the United States can apply to Algeria. However, the United States can take certain steps if a political crisis emerges in Algeria. Like preventive measures, though, the United States’ mitigating options are similarly constrained. In general, the U.S. approach to political instability in Algeria should be based on consensual de-escalation. Given the limited U.S. insight into Algeria’s decision-making bodies and Algerian resistance to foreign interference in its domestic politics, direct collaboration between U.S. and Algerian governments is not feasible, and Algerians would resist coercive de-escalation. Indirect actions would ensure a favorable outcome for both countries and avoid the inadvertent creation of a worse problem (as happened in Libya). In short, U.S. policy should be predicated on the primacy of Algerian sovereignty and it should ensure that it acknowledges Algeria’s right to self-determination. If Algeria undergoes a legitimacy or succession crisis, the United States should not only keep diplomatic lines of communication open between Algiers and Washington, but it should reinforce them. With that in mind, the United States should be better prepared to manage any potential crisis by upgrading regional intelligence capabilities, identifying U.S. assets in the region, and forming a Department of Defense–led fusion cell with the State Department, in which expertise and resources are shared, to address the crisis’s scope and impact. In addition, to the extent that it is not already, the United States should prepare its embassy in Algiers for an emergency evacuation, including pre-positioning assets in the region, establishing communications channels with potential partners, and increasing general readiness. Beyond these unilateral measures, if Algeria undergoes a legitimacy or succession crisis, the United States should not only keep diplomatic lines of communication open between Algiers and Washington, but it should reinforce them in order to clearly signal to Algiers that the United States is a strong Algerian ally. Algeria’s allies—including Tunisia and multilateral institutions such as the African Union—will also need help stemming potentially destabilizing spillover effects. The United States can support those efforts by continuing its programs to improve internal and external security and stimulate economic growth in Tunisia, and its good governance and peace and security initiatives with the African Union. The United States should also renew its support for a political resolution in Libya, with the goal of stabilizing the country rather than simply containing instability that emanates from it. European governments have also expressed concern that an Algerian leadership crisis would lead to broader social unrest and potential violence across the region. Foremost among these concerns is that spillover would result in increased migration from Algeria itself or from elsewhere throughout the Sahel and Sahara. The United States should work with individual European governments and the European Union to ensure and support just and humane European migration policies. This latter mitigating measure, however, may be unrealistic or difficult to implement in light of the Donald J. Trump administration’s established policy preferences toward immigration as well as present political attitudes in Europe toward trans-Mediterranean migration. Algeria’s privileging of stability above all else could allow it to avert a crisis. But in light of Algeria’s regional importance, the United States should not ignore the risk that Algeria will succumb to political instability. Given Algeria’s commitment to its sovereignty, the United States cannot directly steer Algeria’s political trajectory, nor should it. Algeria was isolated prior to the instability of the 1990s, and violence in Algeria persisted during its dark decade because its regional and international allies and partners abandoned it. The United States can ensure that Algerian instability during an irregular political transition would not have a similar effect by fostering Algerian diplomatic and economic integration with Europe, the Sahel, and sub-Saharan Africa. The most important action the United States should take now is to intensify outreach to Algeria. Because Algeria has been a constant in a region that is otherwise in turmoil, the United States has focused its attention elsewhere. This needs to change. Committees in the U.S. House of Representatives and the Senate need to be better apprised of circumstances in Algeria and the country’s regional importance and should undertake congressional delegations to Algiers and elsewhere in the country. Although Algeria has not historically received much attention from the State Department, Algeria’s regional importance and potential for instability mean it merits regular diplomatic attention. Secretary of State Mike Pompeo met with Algerian Minister of Foreign Affairs Abdelkader Messahel during the fourth U.S.-Algeria strategic dialogue, when they discussed future opportunities for collaboration, and that level of dialogue should continue. In the Bureau of Near Eastern Affairs, the position of deputy assistant secretary for Egypt and North Africa should be filled as quickly as possible in order to maintain open lines of communication with the Algerian counterpart. Pompeo’s counterpart at the Pentagon, Acting Secretary of Defense Patrick Shanahan, or U.S. Africa Command Commander General Thomas Waldhauser should also visit Algeria before the April 2019 elections. While these visits are unlikely to produce immediate results, they will be an investment in the future. The United States should also support Algeria’s leadership and expertise on regional security issues like the Libya crisis, instability in northern Mali, and insecurity in Tunisia. The United States does not have a coherent policy on these issues, and enlisting Algerian help would simultaneously alleviate pressure on the overburdened Departments of Defense and State and improve information sharing between Washington and Algiers. Additionally, the United States should promote Algeria’s participation in multilateral forums like the African Union, the G5 Sahel, and the Lake Chad Basin consultations. The United States should reinforce technical aid in areas of strategic interest to Algeria, like agriculture and renewable energy, through the U.S. Agency for International Development, the U.S.-Middle East Partnership Initiative, and the Departments of Agriculture and Energy, with the goal of helping Algeria reduce its grain imports and meet its renewable energy production targets. The United States should also mirror the approach of European allies and facilitate FDI in Algeria by assisting U.S. companies to invest in Algeria’s oil and gas sector. Reviving the oil and gas sector is the quickest way for Algeria to alleviate risk. Lastly, the United States should take steps that it can unilaterally to safeguard its interests, including preparing for an evacuation of U.S. nationals and forming a Department of Defense and Department of State fusion cell. Algeria is too important for the United States not to know more about it and where it is heading. Although Algeria prefers to be left to its own devices, the United States should pay Algeria more mind, understand what it wants and needs, and explore ways in which to help it realize its strategic objectives even in the face of political uncertainty and acute economic circumstances. Algeria’s sovereignty presents unique challenges, but dedicated diplomacy can foster mutually beneficial outcomes and deter future instability.